Being fifty-something, I know we can learn a lot from the animal world. Especially from our domesticated friends, like our Jack Sparrow (pirate cat and bon vivant). Jack’s not the most worldly of cats. He didn’t venture outside for the first seven years of his life (not unless you count that time he fell out the bathroom window). It doesn’t take much to put him off his game. Perhaps it’s our new French doors. Perhaps it’s the particular height of the sun in the sky at this time of year. Perhaps it’s Jack having a midlife crisis of some sort. 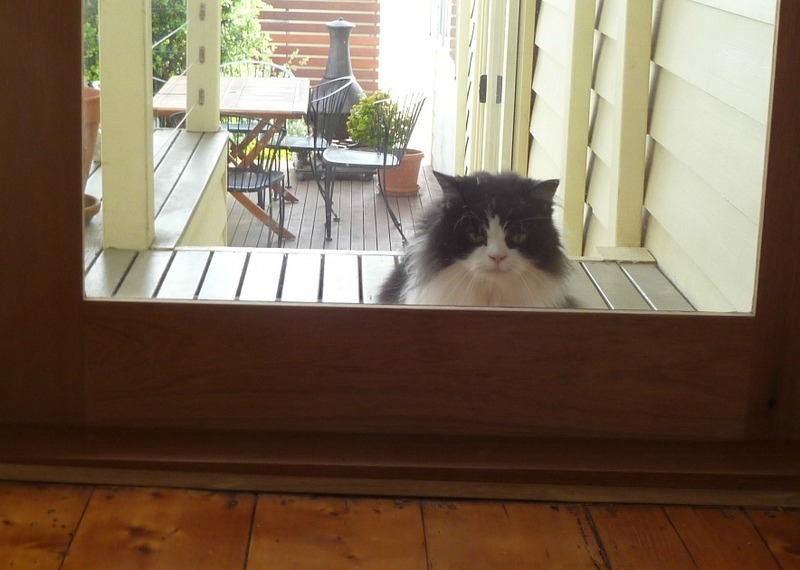 He approaches the back door, meowing to be allowed in. As I swing the door open, it creates light reflections on the decking. Jack is (at once) fascinated and fearful of the reflections. They are his “predators of the wild” to be stalked and possessed. He chases them obsessively around the deck before getting spooked and skittering down the stairs and into the yard. 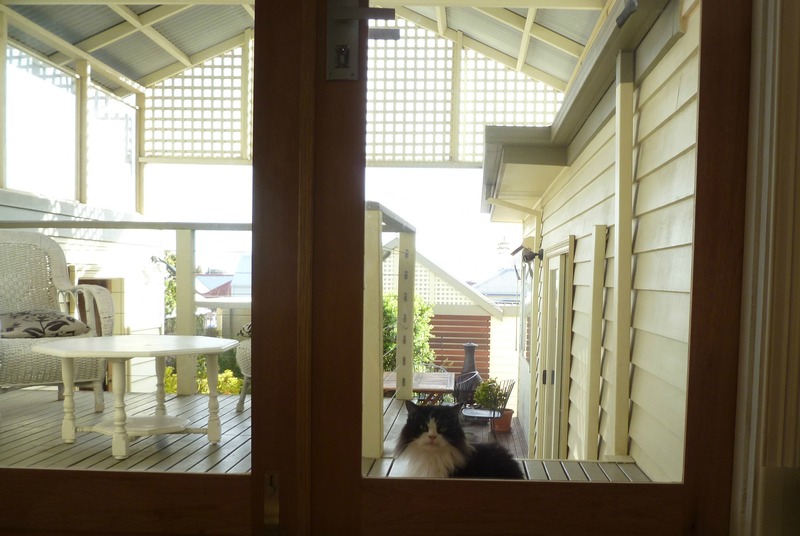 A few minutes later, Jack returns to the door, meowing to be allowed back in. We go through the exact same process again. There it is … the metaphorical circle of life. If I were Doctor Dolittle, I’d deliver that advice in a lilty-show-tune-kind-of-way. And thus the circle of life is broken. Great story – beautiful cat! Jack Sparrow is the spitting image of Tuxie, the cat we acquired when my daughter and fam moved to California (this past Tuesday). He finally ventured out from under the garden shed this morning–hungry for attention. If Tuxie is anything like Jack, you’ll love having him in your life, Teresa. Is that Tuxie-as-in-tuxedo? Jack’s a scaredy-cat … most of our family and friends have only glimpsed him in the distance once or twice. They call him the phantom cat … or Yeti. But when it’s just us, he’s the neediest cat of all. Enjoy Tuxie! S.